KANSAS CITY, Mo. (March 9, 2016) – After completing its Oyster Month during February and its second annual oyster eating competition on Feb. 27, Jax Fish House & Oyster Bar announces the events raised more than $3,200 for the Kansas City chapter of the Leukemia & Lymphoma Society. Throughout the month of February, Jax’s proclaimed Oyster Month, the restaurant donated a percentage of sales from its signature, proprietary Emersum Oysters to the beneficiary. On Feb. 27, Jax held its second annual oyster eating competition, raising more than $1,000 through sales of donated Boulevard Wheat beer and team entry fees. Recently-released Indianapolis Colts quarterback Josh Freeman, a Kansas City native, and his team claimed victory of the second annual oyster eating competition by eating 104 oysters in two minutes. 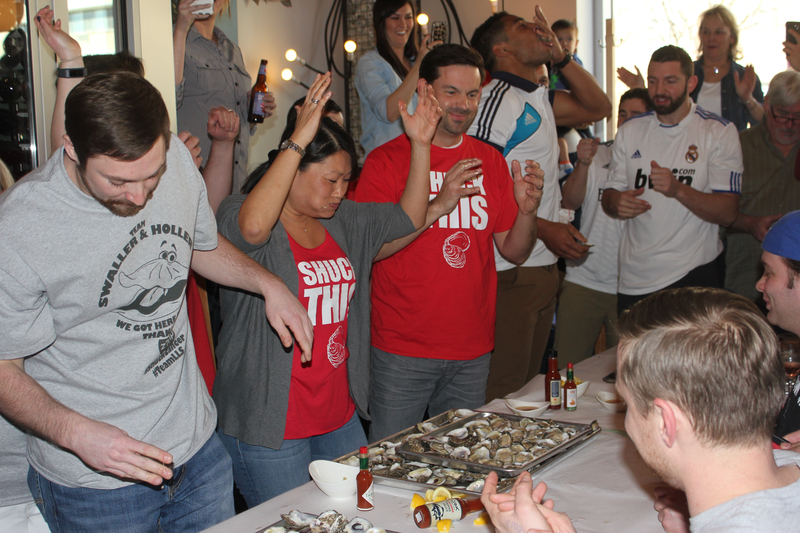 Also in attendance was two-time runners-up “Shuck This,” who slurped 103 oysters in two minutes, falling short of the win by just two oysters. Boulevard Brewery, Cinder Block Brewery, Leukemia & Lymphoma Society Kansas City Chapter, and Major Brands also formed teams for the competition.